This is an annual technical event conducted jointly by students’ associations and faculty from all departments. The aim of the event is to promote effective students–faculty–industry interaction. It is the mega event in which students from all over India are invited to participate. The industry and professional organizations also support the event by way of sponsorship and experts participation. The aim is to provide opportunities for the overall development of the students. This is the 13 th successive year of organizing Technical Symposium. Previous events were grand success whereby around 8000 students took advantage by participating the events and won exciting prizes. 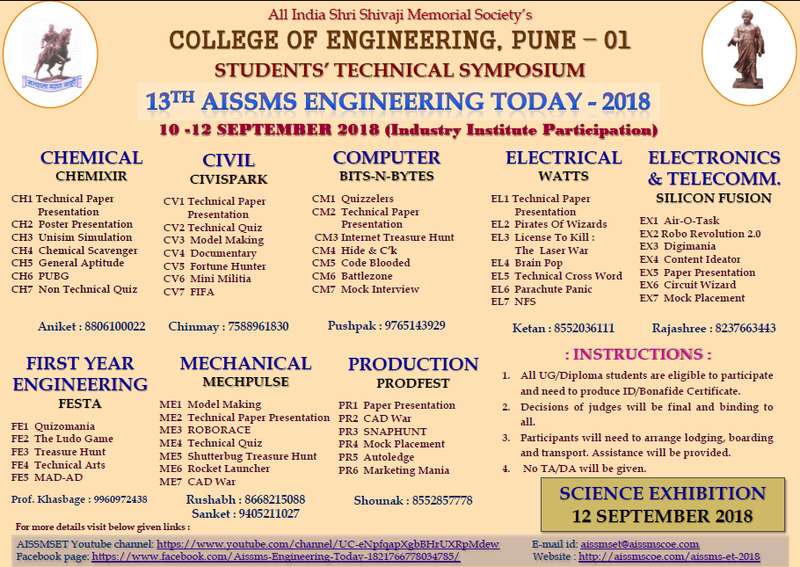 ‘AISSMS Engineering Today’ has become a benchmark of the technical events.